Thank you very much for your interest. I will answer step by step, in several single posts, in order to ease citation. Some more general remarks first. All our findings that have an effect on the problem's final score -- and so led to the refutation of the known professional solutions -- are explained in the 2011 book. All other -- later -- findings can be valued to be somewhat "technical" only, these do not affect the outcome of the problem any more. you will be fine with our 2011 book. How to begin with ? As a matter of course, Volume I contains many more variations than our 2011 book. Its structure is nested, complex, and somewhat confused. It was a lot of work to re-organise the order of variations -- that has grown historically over a long period of time -- so that (with only a very few exceptions) the result of a higher-level variation is always better (for its initiator) than the result of the corresponding lower-level ones. These maps might be useful, especially if you ever find a mistake in one of our sub-variations that changes its outcome. You will be able to easily identify, whether there are implications on higher level variations. There is the danger that you will find some of these sub-variations superfluous, or boring. However, it is very difficult for me to decide on the erasure of such a sub-variation. Due to the "cloudy", and complex, structure, it is not unlikely that there is a reference to just this sub-variation -- or any in its immediate surrounding. Last edited by Cassandra on Wed May 13, 2015 10:08 am, edited 1 time in total. -- The creation of the Hanezeki in the lower right corner, including the flight of the Hanezeki's Tail through the centre of the board (until shortly before its end). -- The very decisive moment of the problem, with my Guzumi played in the upper right corner (no other move will win Black the problem). -- The plain sailing rest of the solution sequence, wherein nothing decisive will happen any more (possibly with the exception of Yamada Shinji's Tsuke in the upper left corner). Most voluminous is section 2, including a very extensive treatment of Joachim's Ko-Semeai (found in mid-2011). Section 2 also contains the discussion of an idea of Michael Redmond 9p, with respect to a Kikashi in the upper right corner (that "would 'naturally' come into a professional's mind", but does not really help in the problem). Each section starts with "Technical Notes", i.e. a selection of technical aspects, which discussion we assessed to be too special for our general overview "A Summary of Our Solution" (slightly extended, compared to our 2011 book). Last edited by Cassandra on Wed May 13, 2015 6:37 am, edited 1 time in total. Prof. Jeong SooHyun 9p (from Myongji University), and Ōhashi Hirofumi 6p, kindly provided us with indications on the correct timing for starting the "endgame" of the problem (much earlier than in our 2011 book), and on the correct order of moves for filling the Nakade on the left side. We also found that it is technically correct to play Harry's Hasami-Tsuke-sequence in the upper right corner before the Guzumi (and not the other way round, as in our 2011 book). Prof. Jeong SooHyun was so very kind to validate my idea of the "second Throw-in" in the Hanezeki (of which Fujisawa Hideyuki 9p originally said that it would be fatal). This move is also used by Cheng Xiaoliu 6p in his 2010 book. Joachim's "late" Oki -- that put Fujisawa's originally solution into question -- is also used by Cheng now. Cheng gives the result of the problem as "Jigo" now, but he missed Yamada's Tsuke in the upper left corner, gaining two points for White. Seen overall, Harry's Hasami-Tsuke-sequence is assessed to be a "natural" endgame sequence. However, its territorial effect (four points) is only valid in conjunction with my Guzumi; there is no effect with the "classical" line of play. So far, no professional engaged found a flaw with my Guzumi. We discuss all the "new" variations, given by Cheng in his 2010 book (as compared with his first 1988 / 2003 book), also correcting some of his oversights. Michael Redmond was so kind to provide us with some stunning Tesuji, when commenting White's strongest Tenuki-option after my Guzumi. Volume II begins with the treatment of all the professional solutions that are known to us, including their sub-variations. Herein, you will find all the (sub-) variations that are special to the professional line of play. "The Evolution of Professionals' Knowledge" explains the historical professional path -- from Fujisawa to Cheng. The second part of Volume II (= part 3 seen overall) discusses the "Evolution of Amateur's Knowledge". can also be found in our 2011 book. In 2014, Harry revealed some very interesting aspects in one of the "classical" Hanezeki-problems (containg the well-known "basic" shape"), which we explain in detail. Joachim's Ko-Semeai is not trivial at all. We encountered massive difficulties in browsing through all the possible variations, in order to "prove" that this Ko-Semeai is no valid option for Black. As "usual" with Dosetsu's masterpiece, Black has one liberty too few to be successful and / or one Ko-threat too few. Therefore, we tried some kind of "reverse engineering" -- starting with a later moment in these sequences -- for comparative studies in "Joachim's Ko-Semeai -- Putting the Cart Before the Horse (2013 - 2015)". This second, different approach helped us a lot to find mistakes in our earlier sequences. The third part of Volume II (= part 4 seen overall) contains further topics. can be also found in our 2011 book (in principle). There is a supplement on Hanezeki, due to Harry's findings, mentioned above. "About Ko in a Semeai Between Two One-Eyed Groups (2012)" was my first attempt to create a different approach on Joachim's Ko-Semeai, using simplified positions. However, there were some rumours that this chapter might be too mathematical orientated, thus I finally developed "Putting the cart before the horse". 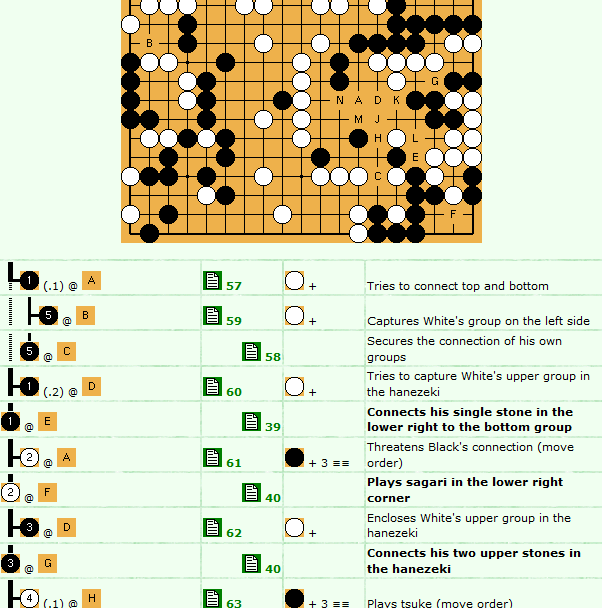 "Igo Hatsuyōron 120 and Go Playing Programs (2009 - 2011)" explains my trials with Many Faces of Go during the investigations in White's Tenuki-variations after my Guzumi. All the contents described above, which has been developed until mid-2013, can be found in our 300th Anniversary Edition "The most difficult problem ever: Igo Hatsuyōron 120" with SmartGo Books. A few days ago, Harry Fearnley of our amateur research team found a mistake in our previous solution to Igo Hatsuyoron 120. Harry revealed an AlphaGo-ish large trade on the board that we hadn't considered before. Details can be found at our website. first, followed by the second push of B 97, and the final sagari at B 99. W 100, and B 101, start the mutual occupation of opponent's liberties in the Main Semeai. , b) or playing tenuki to start with the reduction of Black's upper left corner (c, d), but none of these options will lead to success. According to our amateurish analysis, Black will indeed win by at least two points, after White had allowed Black to play the kikashi in the bamboo joint. A main factor for Black's success is the still non-outplayed top left corner that Black will want to defend at an appropriate moment for a large territorial gain. Therefore, we had to consider how White could take this opportunity out of Black's hands. is not mandatory at this moment (completing the nine-stone nakade was gote for Black). White is forced to play the "classical" atari W 86 at the top left, starting the endgame "early". Please note that choosing Yamada Shinji's tsuke at b, instead, will not lead to success, as it is a bit too soft (with regard to potential follow-up moves in the corner). Later, White will capture the nakade, with a move at d, and also start the remaining endgame at the left side of board, with a move at e.
It results a change in the order of moves with the published professional solution, but White never got the opportunity to successfully play Yamada Shinji's tsuke. Now, the professional solution will really end in a draw. You might want to take this result of our amateurish analysis with a grain of salt, as there is no professional confirmation yet. Please note that this SGF does NOT contain any detailed commentaries, but displays only the final scores of forthcoming alternative moves (labeled with A, B, ..., instead of EidoGo's 1, 2, ...) for easier orientation at the branching points. Please also note that I was not very attentive with the order of moves during the sequences, especially with the mutual occupation of liberties in the Main Semeai. Forgive me for asking, but what is the merit in studying this position? Plainly the problem should never have been included in Igo Hatsuyoron - it is malformed. I remember being sent problems to be typeset for the BGA journal. If a problem was wrong. I sent it back and didn't look at it again. Please have a look at our website that mirrors the contents of our over 1.000 pages books. At least, we had got an (inofficial) confirmation by Prof. Jeong SooHyun 9p from Myongji University, Seoul, Korea. He was so very kind to write us per email that he was unable to detect any flaws in Our Solution. Fujisawa Hideyuki 9p, as well as Cheng Xiaoliu 6p, published professional solutions to the problem, what I take as a valuable evidence that the problem is OK. If ever, Igo Hatsuyôron 120 might be considered "malformed" in that kind, that it is very generous with amateur's mistakes, but not with professional ones. In this context, it is my firm belief that Inoue Dôsetsu Inseki implemented this characteristic on purpose, being well aware of the blind spots of his professional collegues. Last edited by Cassandra on Wed Sep 27, 2017 7:20 am, edited 1 time in total. I'm not sure you get my point. Do you believe that the solution you present in your book was that originally envisaged when it was included in Igo Hatsuyoron? I don't. Igo Hatsuyôron 120 has a lot of internal interdependencies, as well as a lot of issues that are decided by one (missing / surplus) liberty or by one (missing / existent) stone. Unfortunately, most of the 1.500 problems created by Inoue Dôsetsu Inseki were lost in fire. Some (local) elements of the problem can also be found in John Fairbairn's "Today We Have a Splendid Feast", so I would like to assume that Igo Hatsuyôron 120 is the final masterpiece that contains a lot of issues already covered in the 1.500 easier local problems. Whether there was a special problem included that had my guzumi as part of the solution? Who knows? Probably AlphaGo might be able to decide this issue? We know from the Meijin Inseki's writings that he was very alive to the value of providing structured teaching material. There is nothing remarkable about that - teachers of all levels do it routinely. What is remarkable, perhaps, is that there is so little of it in go. It is my belief that the Meijin Inseki did not know or even care whether this problem had a solution, let alone whether it was the hardest ever. Don't forget that the labels about longest-ever solution are modern journalese. I believe he simply constructed an open-ended problem which had many potential twists and turns (which was well within his capabilities, as we can infer from his other problems) as study materials for his pupils: here, look at this, see how far you can take it! This is relevant to another current thread, about the way to study tesuji. I feel sure Inseki was well within the camp of those who think the proper way to study L&D/tesuji is to learn techniques. I believe the style of his problems illustrates that (i.e. they are instructive and practical, even if advanced). He did not compose problems for entertainment (he did not sell books). Tsumego as entertainment probably has a long pedigree. I can easily imagine that many of the problems in Gateway To All Marvels were singletons brought out as party pieces when ancient Chinese scholars (amateurs, note) invited friends over. Hints in old poems and the fact that the problems were given literary names seem to fit that scenario, as well as the continuing similar practice of inviting friends to look at a rare piece of pottery or picture, or to listen to a new piece of music. But around 1600 tsumego in both China and Japan began to be collected en masse by "professionals" (Honinbo Sansa, Guo Bailing, et al. ), the use of names fell away, and the emphasis shifted to practical value (hence also e.g. the emergence of invasion and yose problems). In that sense the Meijin Inseki was a child of his times. Tsumego as entertainment probably did not disappear, but it was then in the shadows until newspaper columns began. Exactly as with chess, newspapers published single problems purely for entertainment. And exactly as with the Sam Lloyd type of chess problems, tsumego problems often bore little relation to reality (e.g. ishinoshita: ubiquitous in problem books, rare in real life) - and what they did teach could be taught much more efficiently. But they were designed to entertain amateurs, so that didn't matter. Except that the practice took on a life of its own as the amateur world grew. In my view, the result is that too many amateurs today are using the wrong tools (entertaining tsumego) to learn the wrong things in the wrong way. The Meijin Inseki and Cassandra's way is the right way for those who wish to improve significantly. A snide little answer is that I don't want to study to be 1kyu, but that's altogether too selective for starters. Attractive as IH120 may be to the Go Beasts, I just can't see it as forming the basis for a good structured study guide. I'm sure you can learn from studying the IH itself, but perhaps there was a reason 120 became lost. Since I am so averse to it, perhaps I had better avoid reconsidering my opinion. Saying you don't like a book or that it's not good enough for you is not snide, but not explaining why may be - at the very least not helpful. And saying "perhaps there was a reason 120 became lost" probably is snide, when (a) it was never lost and (b) the consensual reason it never came to light earlier was that it was part of a problem collection that was considered so valuable it was best kept secret by the Inoue family. Actually, it's not my cup of tea either, and the reasons in my case are that I don't want to study to become stronger and that, if I did, I have access to books in oriental languages that would suit me better (i.e. pander to my laziness). But I can see merits in Cassandra's book (which I have nevertheless only skimmed through), and I hope I've made those plain enough for others to consider it as an option if it's to their taste. The story begins in 1999, when Joachim Meinhardt 4k from Frankfurt / Main got interested in studying Igo Hatsuyôron 120 for himself, based on a solution sequence that he found at goproblems.com (introduced as "Dosetsu's problem" by Merlijn Kuin 6d from Amsterdam). The problem looks like a middle game position that – in principle – could have been taken from a real game. However, there are 71 white stones on the board, but only 70 black ones. So what happened to Black's 71st stone? There is (only) one place at the lower right edge of the board, where White could have captured a black stone, and connected afterwards. This implies that the solution sequence must provide Black with a lead by at least two points on the board to enable him winning the game. Unfortunately, the solution at goproblems.com did not include any moves of the succeeding endgame sequence on the left side of the board, after the complete dissolving of the hanezeki in the lower right in the Capture Variation. The final result was specified as "Black + 2". Therefore, Joachim had to try on his own. His best guess for the endgame resulted in "Black + 3" on the board. This was a strong indication that his assumption of the missing black stone might have been correct, resulting in the given final score of "Black + 2". Nothing serious had happened yet, and Joachim's investigations came to a pause in 2002. However, in 2005, Fortuna decided to let the wheel of fortune make a lucky turn. The German Go Journal published an article about the solution to "The most difficult problem ever". But no, this article was not about Igo Hatsuyôron 120, but about Xuanxuan Qijing's famous problem 大鐵網勢 ("The Big Wire Net", also called "The Emperor of Tsume-Go"). Coincidentally, Joachim was directed to the internet pages of Jérôme Hubert 3d from Paris, where he stumbled over another, alternative, solution sequence to Igo Hatsuyôron 120 (probably taken from the 1988 book on "Weiqi Fayanglun" – Chinese for "Igo Hatsuyôron" – by Cheng Xiaoliu 6p, of which we had no knowledge before 2009). He suddenly realized that – in his self developed sequence for the mutual occupation of opponent's liberties in the Main Semeai – White had only occupied "absolute" neutral points, leaving some valuable points untouched. With Hubert's modification, White was able to capture Black's single stone in the lower right quadrant of the board (but there was a compensation of one point for Black in return, due to the now changed sequence), gaining an overall advantage of one point, compared to Joachim's old sequence. The final score was reduced to "Black + 2" on the board, so considering Black's missing 71st stone resulted in an "ideal" result of "Black + 1". Nothing serious had happened yet, but the wheel of fortune was given another lucky turn. Thereafter, Joachim got to know the 1982 Go World article by Fujisawa Hideyuki 9p (in principle having the same contents as the Japanese original), titled "The most difficult problem ever". In one of the subvariations to his solution, Fujisawa Hideyuki displayed a semeai between White's group at the bottom, and Black's large group in the upper right (the "usual" Main Semeai applies to White's group at the left edge of the board), which Black wins by one move. During the sequence of dissolving the hanezeki (after White captured the hanezeki's tail, and Black recaptured four white stones), White used a placement in the now empty area for attacking Black's group in the corner. This resulted in the second inconsistency found by Joachim: Fujisawa did not use this placement in his solution sequence (wherein the hanezeki's tail is captured much later in the game). Joachim tried this himself and found that White could gain a total advantage of two points by using this "late" placement. Now, White achieves a jigo (draw) on the board, so the question of Black's missing 71st stone was reopened again, in the light that it can be considered absolutely unlikely that Inoue Dôsetsu Inseki created a problem to fulfil the task "Black to play and lose by the smallest margin possible". At least, "Jigo" (without the consideration of a missing black stone) might have been a reasonable result for finishing a given middle game problem, would there not be the remaining contradiction to the given task for solving Igo Hatsuyôron 120, "Black to play and win". Joachim's new findings were also published in the German Go Journal, but still nothing serious had happened yet. Who in East Asia would be really interested in reading a Western Go Journal, aimed at an amateur audience? However, this was the moment, when I got interested into the problem. I tried hard to find a spot on the board for placing Black's still missing 71st stone, but was unable to find any that did not massively hurt one of the known variations. It was also impossible to take any of White's existing stones off the board, for the same reason. But Fortuna intended to make fun of Black once again. In 2007, Benjamin Teuber 6d from Hamburg got the opportunity – during a study visit in Korea – to present Joachim's findings to Yamada Shinji 6p from Japan. Yamada Shinji enhanced the solution sequence for White by introducing another option for reducing Black's upper left corner. The "Tsuke of Yamada Shinji" was born, providing White with a further gain of two points of territory. Black is unable to resist, otherwise he would suffer from an unbelievable seki in that corner. Now, White achieves a win by two points (on the board), totally upsetting the known professional solutions. As long-time editor of the "Problem Corner" of the German Go Journal, I was very well aware of a special characteristic of tsume-go problems: There must be a solution. If you do not see any, try harder, and do so again and again. From now on, the wheel of fortune turned the other way round, favouring Black. My first finding was only a tiny, and still insufficient, one. In his Go World commentary, Fujisawa Hideyuki said that Black must not throw-in for a second time in the upper part of the hanezeki. The reason given was that Black's upper right group lost a decisive liberty by this exchange, and that this led to an unfavourable outcome in a semeai. Despite searching hard, I was unable to find such a semeai, and since then compensation for Black's missing 71st stone seemed to be available, as Black's additional early sacrifice counter-intuitively resulted in a net gain of one point for him in the Capture Variation. But Black furthermore lacked an additional three points for winning the game. The discovery of Black's game-decisive move in the upper right corner, a guzumi ("usually" considered to be a "bad shape" issue), took me about three month of continuous intense analysis, including the detection of a suitable moment for playing this move successfully (i.e. just before the hanezeki's tail has reached its maximum length). This guzumi destroyed three points of white territory in the Capture Variation, so wining the game for Black again. It results the "ideal" final score of "Black + 1" (now including Black's missing 71st stone, due to the earlier found second throw-in in the hanezeki). Everything was OK now? No way! Unfortunately, the guzumi is gote locally. White has a wild bunch of options for playing tenuki that include very difficult considerations in the upper left corner, as well as long endgame sequences. Many of the most promising tenuki options ended in a range from "Black + 1" to "White + 1", relying on deficient amateurish endgame capabilities. In 2008, at the European Go Congress in Leksand, Sweden, I tried to get some Chinese professionals interested in our solution, but in vain. At least, Cheng Xiaoliu seemed to have got some stimulation for his forthcoming 2010 book on Weiqi Fayanglun. After I had invested two years of intense study into the consequences of the guzumi, Fortuna showed mercy, and turned the wheel of fortune again. In 2009, Harry Fearnley 2d from Oxford joined our team, being excited about "beast" on the Go board, especially about all sorts of strange seki. Harry introduced "his" hasami-tsuke in the upper right corner, and asked a simple question: "Did you ever consider this common endgame technique for reducing White's territory?" In conjunction with the guzumi, Harry's hasami-tsuke destroyed another four points of White's corner territory, bringing all the close results after White's tenuki options on the safe side, hopefully compensating for all the weaknesses in amateurish endgame sequences. If White answers Black's guzumi locally, a final score of "Black + 5" results in the Capture Variation, so White will choose the Semeai Variation, instead, that gives her the better result of "Black + 3". As it eventually turned out, none of White's tenuki options provided her with a better score than this. From now on, our further investigations revealed only technical issues (e.g. changes in the order of moves), but did not affect the final score any longer. Harry found a "Circular Hanezeki" (arising only after mistakes from both sides), a theoretically predicted "beast", but that has not yet been underlined with a concrete example. We detected that it would be technically best to play Harry's hasami-tsuke first and the guzumi thereafter. Joachim focused on potential alternatives to the guzumi. Trying to defend the upper left corner (after the Crosscut Sequence in the centre), instead, resulted in a semeai between White's group at the top and Black's large group in the upper right, which includes a very complicated ko fight (i.e. "Joachim's Ko-Semeai"). We analysed a wild bunch of variations, but eventually we had to conclude that Black will be unable to win this line of play. Capturing White's group at the left does not work either. Our intense work on "Joachim's Ko-Semeai" –and thus also on the problem itself – stopped in 2014. Recently, our hiatus was interrupted temporarily. Harry found a flaw in the order of moves in our solution, concerning the timing of the atari in the hanezeki. Joachim analysed the effects of using Michael Redmond's kikashi in the professional solution. Studying Igo Hatsuyôron 120 is of no practical use for today's professionals. The problem is extreme complicated and very challenging, so even a professional needs a lot of time for diving deep enough into this problem. Utilizing other (modern) sources is much more efficient in order to become stronger. Therefore, we are very grateful that some (also semi-) professional Go players – with connections of various intensity to the Western Go world – kindly spend a tiny amount of their valuable time to glance trough our materials, and assisted us with valuable hints. I strongly suppose that these professionals "felt" something in our amateurish work that reminded them of something similar to professional attitude. Following the rough estimation of Kang KyoungNang 7d from Korea, it seems very unlikely that Black could successfully dispense with creating the hanezeki in the very beginning of the solution sequence. She also put us in contact with Professor Jeong SooHyun 9p from Myongji University in Seoul. Prof. Jeong was kind enough to tell us that there didn't seem to be any major problems within our sequence (I think that this was no confirmation that our solution is correct). However, he also pointed out that two points should be corrected. The Hanezeki Exchange should be played later, and the endgame on the left side of the board should be started much earlier than we did so far. Ôhashi Hirofumi 6p corrected the move order for filling the five-point nakade. Michael Redmond 9p showed us some astonishing tesuji in the tenuki variations after the guzumi. He also introduced "his" kikashi in the bamboo joint as a usual technique for providing Black's large group in the upper right with an additional liberty. However, in the problem, Black has no use for this gain. Last edited by Cassandra on Wed Oct 04, 2017 1:44 am, edited 2 times in total. If you want to get an idea how you can manage to lead your own Go to a self-imposed goal, our story of Igo Hatsuyôron 120 might provide you with a suitable example. – ... and any interruption of your journey will become only an insignificant event of the past.